When it comes to commercial foundation repair, Atlas Piers has the necessary solutions to keep your structure stable. The integrity of your establishment relies heavily on the stability of the foundation. as the foundation supports the entire building. If your building has a shifting or sinking foundation, you may need to invest in commercial building foundation piers. Foundation piers are an excellent solution for most failing foundations. They are able to effectively lift and stabilize the foundation to keep your building from developing other problems. Atlas Piers provides a selection of different foundation pier services for your commercial foundation repair needs. When the soil beneath your foundation erodes or shrinks due to drought conditions, voids may form under the foundation. This lack of support beneath the foundation can cause it to sink or settle. This problem might also be the result of too much hydrostatic pressure in the soil around the foundation, pushing on it and making it crack or shift. Fortunately, a settling foundation can usually be fixed or prevented with the installation of foundation repair products like helical piers or steel push piers. Foundation piers are important to your commercial buildings because they can help to prevent and repair most common foundation problems. If your foundation fails, it will cause other problems throughout the structure, such as: bowing walls, leaning walls, cracks in the walls and floors, sticking windows, sticking doors, and sloped or uneven floors. These are annoying issues that can result in expensive repairs. They can also be hazardous to you and anyone else that frequents the building. By investing in commercial building foundation piers for your business, you can save money in the long run and keep your building safe. 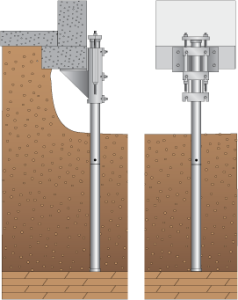 Typically, there are two types of foundation piers. These are steel push piers and helical piers. To repair a failing foundation, steel push piers are driven into the ground, anchoring in stable soil deep beneath the surface. Then, the weight of the structure is transferred onto them and they can be used to lift it to it’s original position. Helical piers work in much the same way. The biggest difference is that they are screwed into the ground instead to provide more support and stability. The installation process of these piers can be done in small spaces, making them ideal for nearly every foundation situation. In addition to foundation repair, foundation piers can also be installed with new construction. Using helical piers in your new commercial construction will keep the structure stable and prevent foundation problems from arising in the future. When you are starting to establish a new company or business, the last thing you want to worry about is foundation repair costs. Choose commercial building foundation piers for your new commercial construction, and rest easy knowing that your building is secure. For the highest quality commercial foundation products and services, choose Atlas Piers. We use quality products from renown supplier ECP (Earth Contact Products) to ensure your satisfaction. Contact us today for more information!